It's been a while since I've felt sand slide under my toes, sucked playfully away by the tide. But today I stood knee-deep in the Pacific Ocean with my friends and enjoyed the soft swirling beneath my feet. I plunged my toes deep into it and splashed in the sandy puddles. My pink toenails flickered from within the waves. Santa Cruz, California is beautiful, of course. But not all of my memories there are good ones. When I was about ten years old, I went to the Boardwalk for the day with my best friend, Julie, and her family. The day itself was quite an adventure. Julie's brothers buried us in the sand and abandoned us for a game of Frisbee. If a passerby hadn't sympathized with our plight, we'd still be there, wriggling under the heavy sand and frantically bobbing our heads. Then, before we went to try out the rides, etc., Julie's mom told us we had to eat something. Fortunately, she'd packed hotdogs. Unfortunately, we didn't have a camp fire or grill. No problem, she said, we'll just eat 'em cold. Such began my worst food day ever. More on that later. I can recall funky, silly things about that day that mean nothing to anyone but me. Julie's sister Connie was a year older than we, and she seemed so wise to the ways of the world. That morning she'd pulled out a pair of jeans and turned them into cut-offs with a few deft snips of her scissors. And boy, were they short! Too short, probably, her mom might have suggested. You're just advertising your behind to the dirty guys at the boardwalk. (She pronounced it bee-hind, which made Julie and I giggle.) But Connie, with a distinct will of her own, shrugged and pulled out a black sharpie pen. As we ambled about the arcades and carnival games we lost count of the boys who stopped to stare at her bee-hind. Of course, at that point you couldn't blame them. Across each back pocket she'd scrawled: If you're reading this, back off! I killed at air hockey, even when pitted against the brothers. For my unabashed victories, I'm sure I was tickled and tossed in the ocean. But I'm equally sure that I loved every second of that attention. We rode all the rides, too. The creakier, the better. Over and over. And I was awfully proud of myself for my absolute fearlessness. Around corners and over steep drop-offs we whipped and wheeled, and I screamed until my throat ached. Everyone knows, of course, that the only remedy for an aching throat is cotton candy. I gorged myself. Julie and I must have put away four whole sticky, pink helpings. Well, one might have been blue. I remember pulling away thick, scratchy clumps of it with my tongue and smacking my lips to savor the sugar. After a while my eyes were spinning in opposite directions, but I kept right on going. The boys sought us out to display their new fake tattoos, tiny, crooked and dark green on their chests and arms. I wanted one, too. But Julie's mom, adjusting her leopard print bra straps, stopped me. Apparently only trashy women have tattoos. Had I not been completely hopped up on sugar and, therefore, incapable of constructing a coherent argument, I might have told her I only wanted to be trashy for one day. It was the Boardwalk, for Pete's sake! Julie bounced a ping pong ball into a glass bottle and won a goldfish. My skin was ringing like a telephone. I kept touching my arms and legs, pressing my fingers gently across my little thighs and watching the skin turn from red to white. But it was dark, and I couldn't really make out the burn. And what a burn. Vaguely I wondered how I could possibly have burned. The second we five kids had exploded from the van and sprinted to the beach, Julie's mom had snatched us by the scruffs of our necks and slathered us with sunscreen. Granted, that was only one time, and we'd spent hours on the sand and splashing in the water. One last ride, the boys pleaded, and their mom agreed. Julie grabbed my hand and pulled me on. It was a spinning ride on a track that whirled around. Double the spinning, double the fun. All day it had been that way. But there in that little green car, with my head caught in the clanging vice of the beeping carnival music, I felt so very very sick. On the turns I slid toward Julie, her little body vibrating with the same amount of sugar I'd consumed, but her half-Hispanic skin glowing a healthy brown after the same amount of sun. My lips were so dry. The trashcan closest to the ride exit caught the cotton candy and the cold hot dog in reverse. Julie's mom pushed a water bottle into my hand and laughed a bit as I tried to walk a straight line. The air felt like heavy cotton. We drove home in silence, tuckered out. But as the other kids slept, my body screamed with every jolt, every pothole. Julie wanted me to spend the night. I was in utter agony. But I wasn't sure if I could go home because it was so late. So I stayed, sitting up because I couldn't put pressure on my back, and with cold, wet wash cloths draped over every inch of lobster-red skin. It was my first big, bad sunburn. And I would have blocked that painful memory out entirely if I hadn't had so much fun at the beach. Since that time I have not touched cotton candy (it makes me sick even seeing the stuff), and I can't go on that final ride either. Funny the scars sunburns leave, huh? 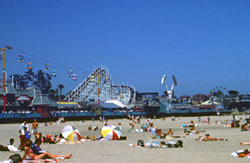 Today, at twenty three years of age, I spent several fun hours in Santa Cruz. But my favorite fifteen minutes were those with my toes stuck delightfully deep in the sand. I really ought to go to the beach more often, especially now that I have control of my own sunscreen. SPF 45.